Not only was the Indie Arena Booth more awesome than ever, but there was even a nice little booth for meetings this time, which Florian Masuth, one of the newer members of the team behind the Indie Arena Booth efforts, escorted us to so that we can have a chat with him about the booth of Gamescom 2017. To start with, Florian explained all the awesome numbers behind the Indie Arena Booth, such as the over 1000 square meters of ground that the booth now covers (which is precisely 1022), the more than 80 games that it hosts and the fact that it has developers who came from over 26 different countries around the world. Even more importantly, the booth has a dedicated streaming booth for Gamescom 2017 which is live during the entire time that Gamescom is running. “The idea started a bit slow and although it was a bit short notice, we found someone who helped us a lot with getting up and running way better than we had ever hoped it would,” explained Florian, when he told us about how Andreas Suika of Daedalic Entertainment stepped in to help the team of the Indie Arena Booth and made everything as awesome as it actually turned out to be for the streaming booth. That is the huge plus basically of being able to work with indie game developers, since there is such a tight and friendly community. The Indie Arena Booth is something we have talked about extensively as well in the past and it is quite impressive to think about how it started from 30 square meters 5 years ago at its first Gamescom appearance and it has now attracted the attention of big investors and even the organizers of Gamescom itself who, as Florian explained, have recognized the benefits of bringing indie developers to Gamescom and have been aiding the efforts of the Indie Arena Booth team a lot. 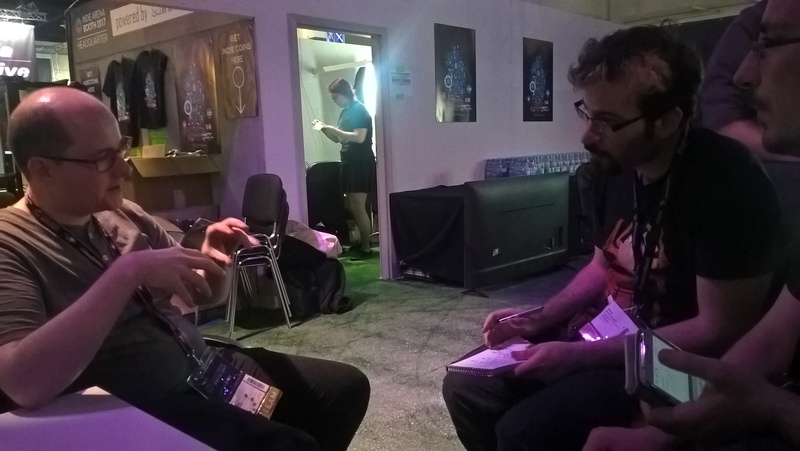 “Our main goal is to give indie developers their best chance at Gamescom,” said Florian and it feels very much like that after having talked to over 100 different indie developers over the course of three different iterations of the Indie Arena Booth over the last three years. So as press that deals exclusively in indies, we can assure you of this ourselves as well. We were told that this is actually the first year that someone from the team had to start working full-time on the whole thing and that was Jana Reinhardt who handles a lot of things for the team, with her primary duties being around PR and handling various important things for the team. “It is really amazing how far we’ve come,” said Florian. “We have been given grants by the EU and even from the ministry of digital infrastructure here in Germany,” he continued. It is also actually the first year that the booth also has mini-events such as the first day’s exclusive to press, developers and investors hours where the booth was closed off so that developers can have more time with actual potential business partners. “It is great for networking,” exclaimed Florian. We experienced the first mini-event and it was great, with even some food and drinks provided by the booth and now we honestly cannot wait for the next one which is the awards show on Thursday. We would like to thank Florian for his time yet again and we are already looking forward to exploring the Indie Arena Booth more and more as the days go by! If you would like to learn more about the Indie Arena Booth, you can visit the official website here.